COLUMBUS, Ohio (AP) The Columbus Blue Jackets re-signed forward Boone Jenner to a four-year, $15 million contract, locking up a player who has been a stalwart presence in the team’s emergence as a playoff contender. The Blue Jackets announced the deal on Thursday. The contract pays the 25-year-old Jenner $3.75 million annually through the 2021-22 season, according to a person with direct knowledge of the contract who spoke to The Associated Press on condition of anonymity because the Blue Jackets didn’t reveal the value of the deal. Jenner was a restricted free agent who made $2.9 million in 2017-18, a season in which he missed all of training camp and the first seven games of the season with a back injury. Although his numbers have fallen off since he scored 30 goals in 2015-16, Jenner was an alternate captain and key contributor down the stretch last season, which ended in a first-round playoff loss to the eventual Stanley Cup champion Washington Capitals. The native of Dorchester, Ontario, said he was happy to get the four-year deal after starting his NHL career with the Blue Jackets. He’ll likely be the left wing on the second or third line. He ended last season with 13 goals and tied his career high with 19 assists. He piled up 12 points in March and logged a goal and two assists in six playoff games. ”I think once things kind of settled down later toward the end of the year, I think I found my stride, and I was obviously happy with my play down the stretch,” he said. 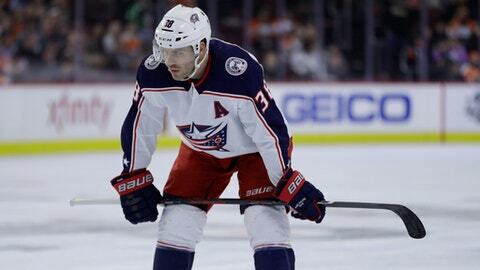 Jenner, a second-round draft pick by Columbus in 2011, has 86 goals and 75 assists in 342 NHL games. His best season was 2015-16, when he scored 30 goals and had 19 assists.